The Buddy Phone D2 is a digital, micro-miniature, ultrasonic transceiver allowing communication between two or more scuba divers or surface stations. Using "Digital Signal Processing" (DSP) techniques, the Buddy Phone produces uncompromising speech clarity. The Buddy Phone D2 is digitally controlled and features a voice menu to guide you to: adjust your Volume, change from Channel A to Channel B, or put the Buddy Phone in a continuous voice transmission mode. The SP-100D Surface Buddy Phone ® transceiver was designed to operate with all single sideband acoustic underwater devices within range and on the same frequency. State-of-the-art Digital Signal Processing circuitry (DSP - known as "Software Defined Radio") has been incorporated ensuring great performance and clarity. The new DSP Squelch circuitry is second to none. Includes 35' transducer cable and a hand held microphone. Dimensions (W x H x D): 9.0" x 7.85" x 3.70"
OTS Spectrum ABV: The most anticipated accessory for the Spectrum Full Face Mask is finally here! 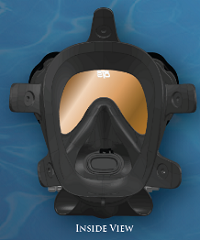 The Ambient Breathing Valve (ABV®) allows a diver to breathe ambient air while at the surface, thus conserving tank air. The ABV® was designed with simplicity, durability and reliability in mind. Installation only requires a few minutes. 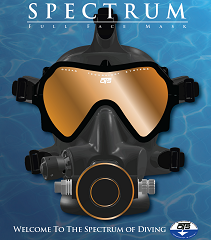 The Spectrum Accessory Bracket system allows a diver to mount lights and other accessories to the side of the Spectrum Full Face Mask. The Spectrum Accessory Bracket allows for two mounting positions : high or low. The Bracket is available with a universal adapter, with an Inodive Light or sold alone. Accessory bracket system easily attaches to OTS Spectrum full face mask. This version includes the “Inodive LED Dive Light". This light is rated at 1watt (80 Lumen), and will burn for approx..4 hours on 2 AA batteries. A double O-ring seal, and magnetic switch, help insure the watertight integrity of the light to 150 feet. 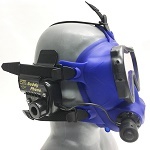 This kit allows a diver to mount most (round) 3rd party lights to the side of the Spectrum Full Face Mask.